Formed in 2011 as an extreme one-man project, over the years they have evolved into a classic heavy metal band with epic elements. After numerous line-up changes and live shows, the band recently released their first full-length album called “Macedon”. Chris Kappas (vocals) had some interesting things to say about the debut and the future plans of the band,..
Greetings guys and thank you for your time. How are things in ACHELOUS’ camp at the moment? Hey Giannis, how are you. Things in ACHELOUS are going great. We just released our first full length album entitled “Macedon” and we are ready to kick the stage presenting our new material to all Heavy Metal fans! ACHELOUS: God of water and all rivers upon Earth. Why did you choose it as your moniker? That was Chris Achelous’ idea from the beginning. His heritage comes from Thessaly, thus what better than the ancient river God Achelous as a band name? Let’s take things from the beginning. 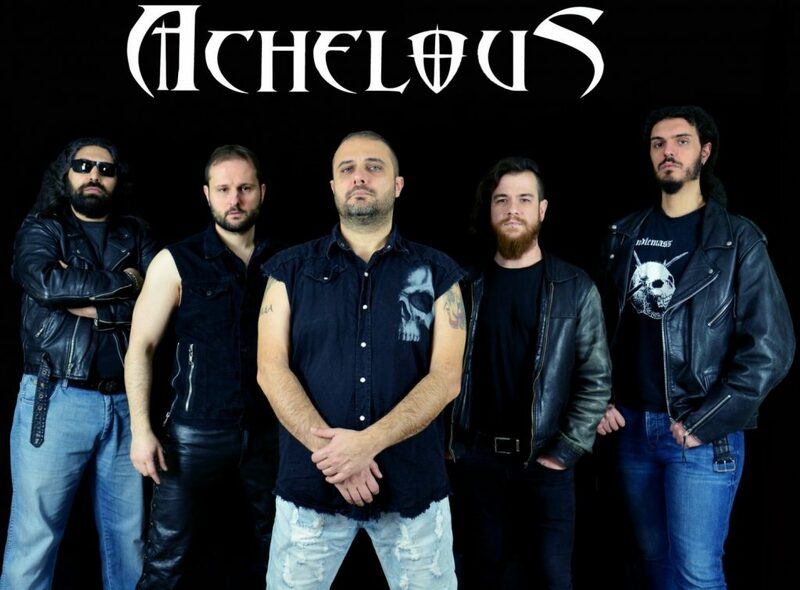 If not mistaken ACHELOUS started as an one-man, extreme metal project a few years ago. How did you end up changing your style? Chris started making music back in 2011. It was a much different project than today’s ACHELOUS, but also similar in some ways. Some of our songs were born that time in a different musical path. They were more extreme and atmospheric, but also epic in a way. We knew each other many years, and I was out of the scene for quite a time because of the birth of my daughter. One day as we were out drinking beers, Chris asked me if I would like to sing in some of his songs. I didn’t think it twice and I said yes without any hesitation. That’s how “Al Iskandar” demo was born and the rest is history! Do you consider today’s version of the band as the continuation of the early days, or did you just liked the name and decided to keep it? Of course it is a continuation. Songs like “Al Iskandar” and “Myrmidons” were composed by Chris that time and the name ACHELOUS exists since then. Therefore it is a living organism that’s evolved through the years. Would you like to introduce us to the rest of the crew? On drums we have a longtime friend of mine, Yannis Roussis, also drummer of the legendary old school death metallers OBDUKTION. Yannis helped the band in many occasions in the past and right now is a full member of ACHELOUS. In the guitars there is Haris Dino the “junior” of ACHELOUS. Haris was associated in the past with bands like DECEMBERANCE and right now plays bass with FLASH OF GAIA. George Mavrommatis is our other guitarist. He used to play with deathsters DESTINY DENIED back in the mid 00’s. 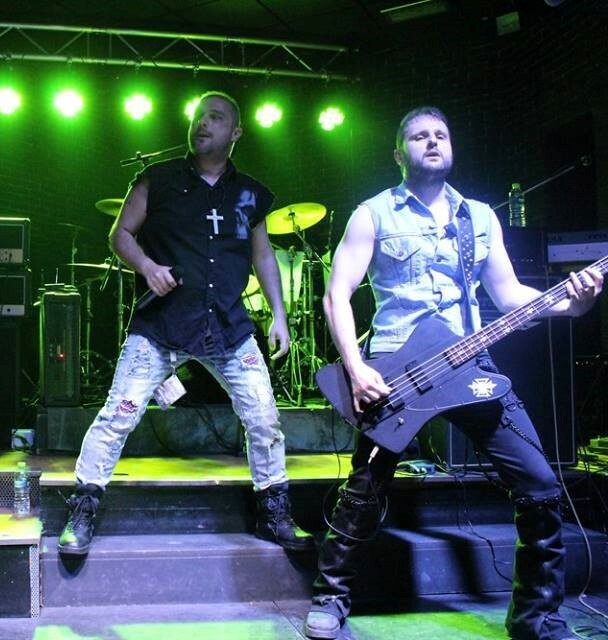 In the bass guitar is the founder of the band Chris Achelous and finally it’s me, Chris Kappas on vocals. I used to front REFLECTION back in 1991 to 2004. You’ve been restless when it comes to releasing stuff. You’ve a demo (“Al Iskandar”, 2014) and an EP (“The Cold Winds of Olympus”, 2015). Would you like to share a few words about them? We have a lot of material that is waiting to be released that’s why we try not to let a lot of time between our releases. “Al Iskandar” was intended to be a demo just for the fun of it. We cut 500 pieces and they were gone in no time getting some very nice reviews. That’s when we decided to go further and continue the project as a band. 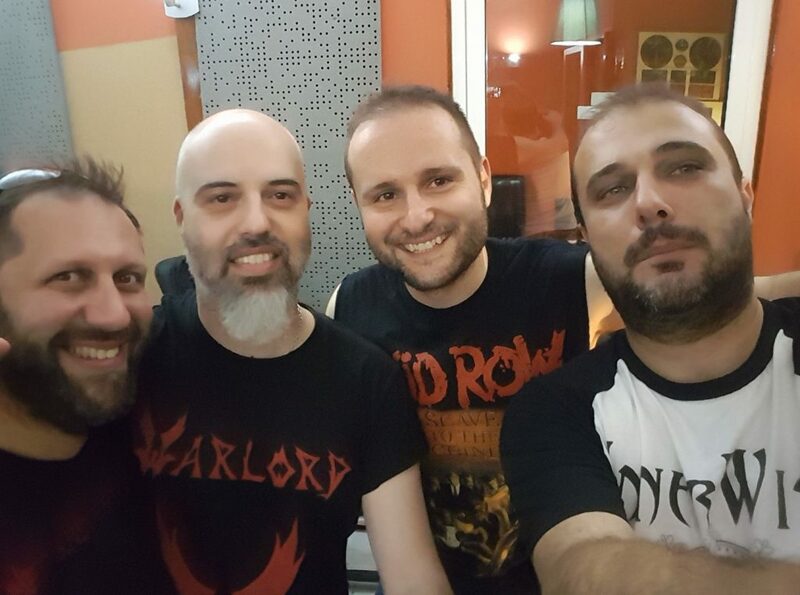 EP “The Cold Winds Of Olympus” was recorded and produced by Stathis Pavlantis at The Music House Studio. It contains 4 songs and it was something like the beginning of ACHELOUS as a band as we made our first live appearances putting the name of the band in the Hellenic scene. After the release of “The Cold Winds of Olympus” new members joined, resulting in ACHELOUS being a fully-staffed metal band. What led to such a change? It was just evolution. We had a CD with nice songs and a strong production therefore we had to promote it and play live. I have to say that after 27 years in the scene I love performing live. It’s what heavy metal is all about. A good album is very satisfying, but being on stage is the exact essence of metal. Earlier this year you released “Macedon”, your first full-length album. Before getting into the details, would you like to do a brief retrospective of what came before it? We faced many difficulties but also many great times. We prefer to keep the great things that happened to the band and continue. Like our first support to a foreign band, the legendary MARTYR, or the amazing experience in Wreck Athens Festival at Kyttaro and of course the sold out live at Modu alongside with our brothers REFLECTION and FORSAKEN (Malta) in front of 300 maniacs! …And all these lead us to “Macedon”. How’s the reception so far? The reception is just amazing. We are getting strong feedback from all sides! We have already sent copies to Italy, Germany, Sweden, etc and the album is only less than two weeks out! Most of the material featured in the album is seen for the first time. Is everything new material or were there any refined ideas from the past? Most of the material is new. We had “Al Iskandar” revisited from the demo but the rest of the songs were composed from 2014 to 2016. There were some older ideas but the main work was done only for this album. To tell you the truth I had “Final Day” in my mind way back in the early 90s with different lyrics, but we had to reshape it and release it for the first time with “Macedon”. How does the songwriting process looks like? Who’s responsible for the music and lyrics? Most of the times one of us bring an idea or a whole song and we then work it in the studio. Sometimes we add or subtract stuff from the song until it reaches its final shape. I know that Stathis Pavlandis (REFLECTION) was responsible for the audio engineering, but would you like to share a few info about the recordings and overall production process? 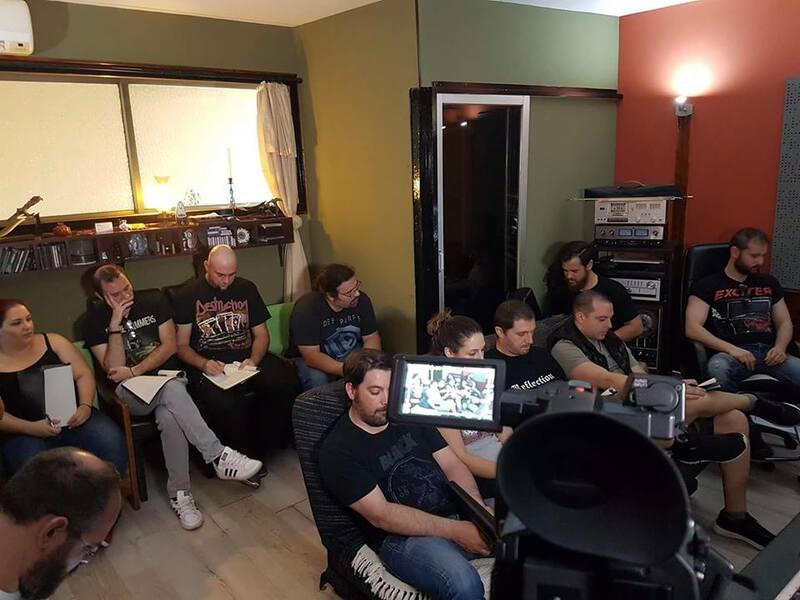 The recordings of Macedon took place in The Music House Studio between early 2017 to mid 2018. My brother in arms Stathis Pavlandis produced the album and my good friend George Kasapidis was the engineer. Actually we had the recordings finished back on September 2017, but when we parted ways with our former guitarists we had to erase all the guitar parts. When George joined us at the end of 2017 he re-recorded all guitar parts from scratch. He did an AMAZING job in such a short time and all that in just 3 weeks! We then had 2 months of mixing and mastering and at the end of April the album was ready. We then started talking with a few labels and finally we agreed to cooperate with Metal Fighters Records. The theme of the album is heavily inspired by Alexander the Great and his achievements. “Il Iskandar” (Alexander in it’s eastern variant), “Hephaestion”, “Persepolis” , etc. Why did you choose this concept in particular? “Macedon“ is a concept album that has to do with the Alexander The Great campaign in Asia. We were thinking for a long time to make such a concept album and everything went clear when we visited the Vergina tombs. Chris was stuck with the main melody of “Macedon” song and the rest is history. I had an interesting discussion with RAGENHEARTH the other day, about how themes like ancient Sparta or Alexander the Great are recurring in metal music. Why not write about other eras/civilizations (eg. Minoans) or more recent ones, like the Byzantium? I believe that this happens because Sparta and Macedonia stories had a huge protagonist with a massive personality. I mean it’s easier to make a concept album on Alexander the Great or Leonidas than a concept album on a whole era. Marauder did that with a huge success on the album 1821. Anyway our lyrics target is not only in Hellenic history and mythology but also in fantasy literature and gaming. We love Forgotten Realms, Dragonlance, games like Dragon Age and we intend to make an album with stories from all these amazing books and games. What do you hope to achieve with “Macedon”? We want to make the name ACHELOUS well known to the underground scene and play live as many times as we can. This album is a milestone for the band and we will do everything in our powers to promote it as good as we can. Are there any promotional events/gigs/tours scheduled for it? Of course there are. First of all we are presenting our album live at The Crow (Sinopis 27 – Athens) at 6/10/2018. We will perform live, the whole album from start to the end and we will also play some older stuff and a few surprises. So do not miss it. Less than 2 weeks later we fly to Malta for the legendary anniversary Malta Doom Metal Festival (20/10/2018) where we will share the stage with our brothers REFLECTION and FORSAKEN and of course huge bands like DEMON, THE SKULL, ANCIENT RITES, NECROPHOBIC and many more. We were also booked for the gig of the legendary BATTLEROAR and LONEWOLF at Kyttaro club (10/02/2019). We also intend to tour various cities in Greece and of course present our music live abroad. How can people get your album or contact you? Information about the band can someone find in our Facebook page (Achelous) and our youtube channel (Achelous). So please like us and subscribe to our channel for more ACHELOUS. For any info about the band or the album you can contact us via our facebook page or via our email (achelousbandgr@gmail.com). I know it’s probably too soon to ask, but do you plan to start working on a new album? Is there any new material in the works? Hahaha … it’s never too soon. Actually we have material for a new album but we will start working on it in a few months. We have to promote “Macedon” as much as we can and I believe if our schedule goes as intended we will have a new album out at 2021 in order to celebrate the 10 year anniversary of the band. Traditional metal stuff have been getting get more attention in recent years. Why do you think this is happening? People want good music. Nice riffs, huge hooks, energy … I believe many fans are tired of super technical stuff and needs more direct, powerful and melodic metal. Something with such intense that only old school metal can provide. Thank you guys, that’s all my end! I’ll let you do the closing. Best of luck with everything coming up! Thank you very much. I hope you all enjoy “Macedon” as much as we enjoyed recording it. Check out our youtube channel (Achelous) for our video clips and live stuff and of course like us on facebook (Achelous) in order to watch first, news regarding Achelous. Last but not least thank you Gianni and thank The Forgotten Scroll for this amazing interview. C U all on stage.